Create your content in a new way! Utilize the Block Editor to freely create individual sections and put together one beautiful piece of content. 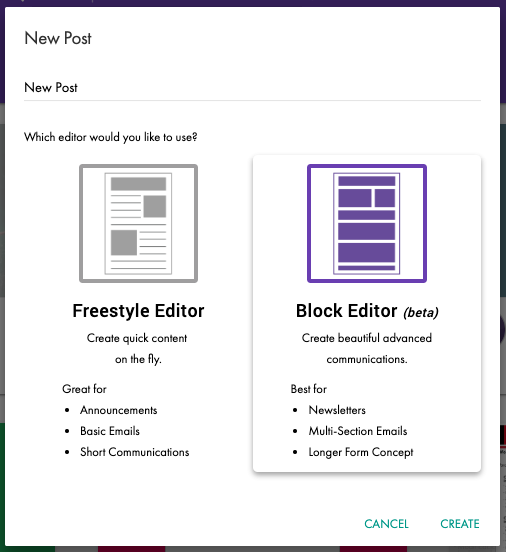 As you create a new Post, you are presented with two different options for editors: Freestyle and Block. Simply put, the Freestyle Editor should be used to create simple, quick announcements or emails. The Block Editor should be used to create longer, multi-section content like newsletters. The Block Editor separates pieces of content, like text blocks, photos, buttons, polls to make it easy to rearrange sections as needed. When you create a new Post, select [Block Editor] for your editor then click the [Create] button. Add to your Post by dragging and dropping a Clip, Asset or Tool. Then, move content around by clicking the [Move] Icon on the right side of the block. Delete, or Edit the content within the block by clicking the options icon on the left side of the block. Please Note: If you don't drag/drop, clicking on the Template, Asset or Tool inserts that block at the bottom of your Post.